The Itty Bitty Kitty Committee: Sit Still AND Stay Awake? 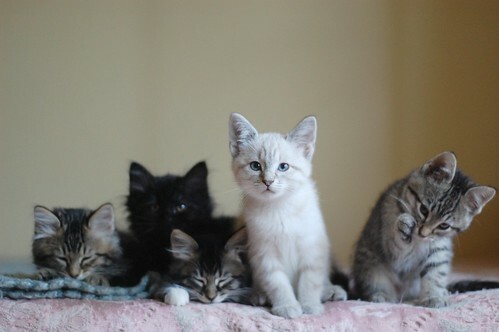 Am I Asking Too much of These Kittens? Sit Still AND Stay Awake? 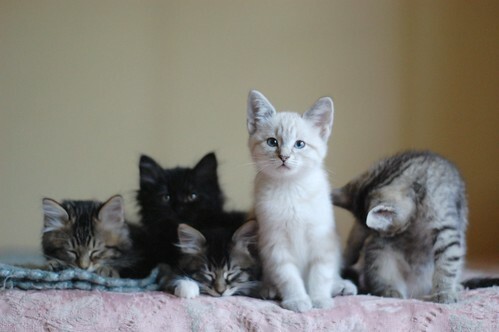 Am I Asking Too much of These Kittens? Not the most successful group shots,,,, but I thought there was still some entertainment value here, so I wanted to post them. Like I've said before,, getting the kittens to gather is only half the battle. Getting their attention, and keeping them awake, is the hard part. Camille seems to be the only one who can sit still and take a picture. 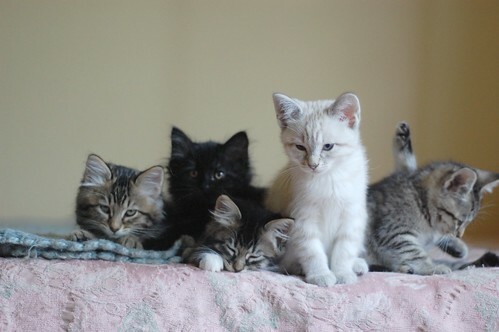 I'd love to see a picture of the whole group lined up and sleeping. Ah, jeez, I just love the group photos however they appear. My favorite is the mid-lick look, like your photo is interrupting her bath. "Do you mind?" Is that Marie-Noire's paw on top of Biscuit's head? These 'behind the scenes' photos are always so divine. I can imagine being there. Camille is obviously a 'professional'...Cover of Vogue soon? Oh my gosh look at Camille's alert little face...could you just die?! Marie-Noire's such a good girl. She's the only one who pays attention the entire time! Camille is thinking, what other kittens? I am ready for my close-up! OMG Laurie only half a squillion to go!! I'm on the edge of my seat! Mid-bath sister is also cracking me up. There's kinda something for everyone in this batch, it seems...color, personality, etc. So sweet. AWESOME to see the ticker so close to 100% of goal! They are all so beautiful! To get them just to stay in one spot for a picture is awesome! Laurie - YOU DID IT!!!!!! YEAH for IBKC peeps! Woohoo! I'm proud to have helped the IBKC with my little donation! Well done Laurie & the IBKC community! Congratulations, Laurie and everyone - especially the kitties who will be taken in by the Tacoma/Pierce County Humane Society in times to come!!!! I love what this community can do to help the kitties. Bless you all!!!!! OMG we all did it!! Congrats to Laurie, the IBKC community and of course all the furry babies who will benefit. Aw, I think Marie-Noire is the best poser, and Camille too until she looked like she was getting hit by the same nap attack that got Biscuit & Ve Ching. Betty June wasn't ready to pose yet as she was busy grooming. Do I hear "But...this is my nap time."? And "But...this is my bath time." I think it's adorable how two of the tabbies are just konked out sleeping in most of the photos. I love the first pic in particular. It's a natural, as they are pose. A bit more dynamic than just everyone looking straight at you. SQUEEEEEEEEEE!! You kitties are such terrific little girls. And I have to say it again, Marie-Noir = statue! Look at her hold those poses!